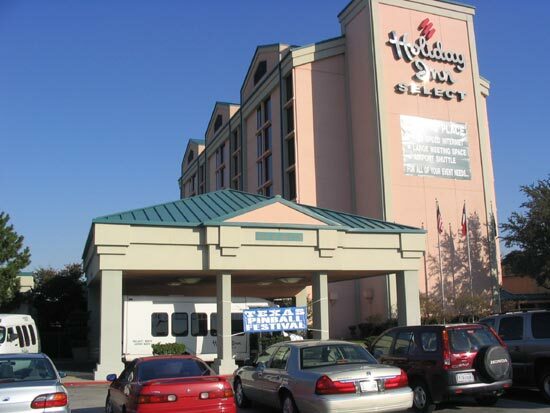 The weekend of the 28th, 29th and 30th October saw the 5th annual Texas Pinball Festival take place at the Holiday Inn Select at Irving, Texas, USA. The hotel is a high quality establishment - the kind that leaves you mints on the pillow and provides a king size bed the size of some small countries. And all for just $59 a night. 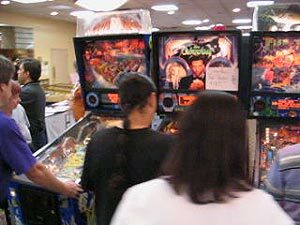 They also provide free wireless internet which made it easier for Pinball News to provide daily updates from the show floor. Events actually started on Friday afternoon at 5pm when the hall was opened to visitors for an evening session of game playing and tournament qualifying. sold but this represents the best record of games in attendance. NASCAR x 4, Xenon, Scared Stiff and Vampire. 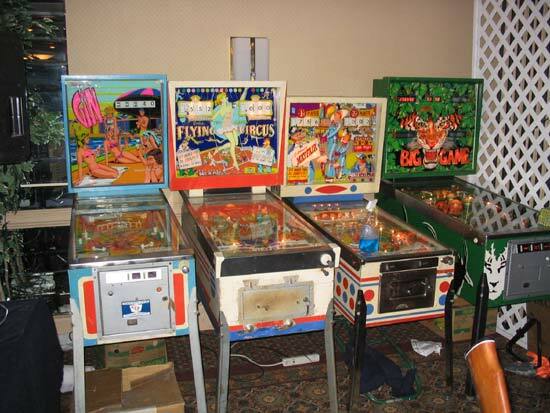 By and large, the games were in good condition and those not capable of free play were loaded up with plenty of credits. But some of those seemed to have quite high replay levels which led to the credits running out before too long and a dead period before the owner topped them up again. 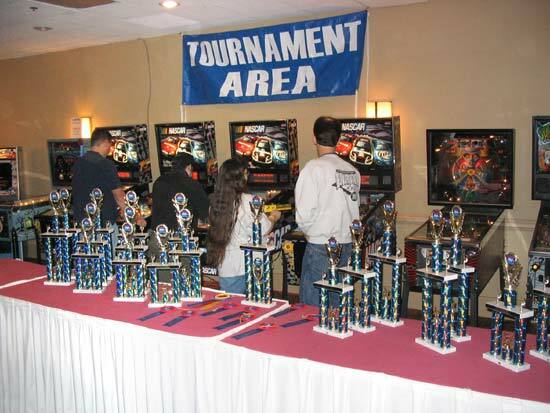 Friday evening was the time to begin qualifying for the Wizard Tournament and the Classic Arcade video game tournament played out on a Donkey Kong game along with the "Draw Your Partner" pinball competition. The hall stayed open until 2am which was late enough for the first night. Saturday morning saw the swap meet in the car park outside the hall between 8am and midday. It was a modest affair with only half a dozen sellers but they did have some interesting games and parts for sale so was a worthy addition to the show. Slot Depot and Dallas Arcade. The range of parts available was surprisingly wide with some less common circuit boards and playfield assemblies nestling among the piles of more familiar spares. 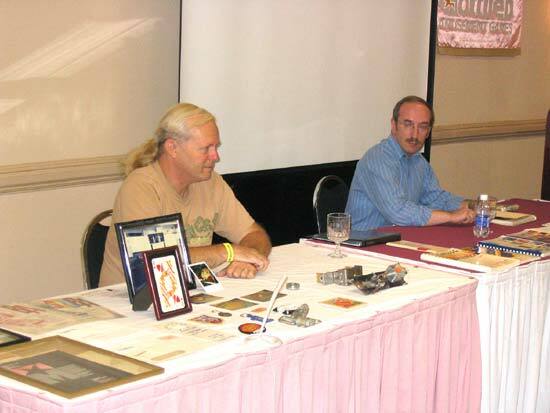 The single seminar of the show was held by John Osborne and John Buras, two famous game designers from the Gottlieb company. Black Hole and Haunted House and these games were the core of their talk. John Osborne went first and spoke about how he started out in the company testing games, assemblies and cabling. 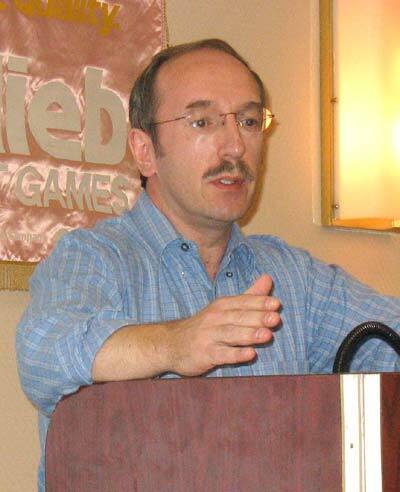 He worked with Krynski on a couple of games - Pro Football and Gridiron before he was asked by Wayne Nyens to design his first game Hit The Deck, a game he described as "a bit posty" because shots kept hitting posts instead of scoring targets. He later developed a scoring post but it was never produced. At the beginning of the eighties, the Gottlieb management got a Bally Xenon game and liked the way the ball could rise above the playfield in the perspex tube, so they wanted to try out some multi-level games. 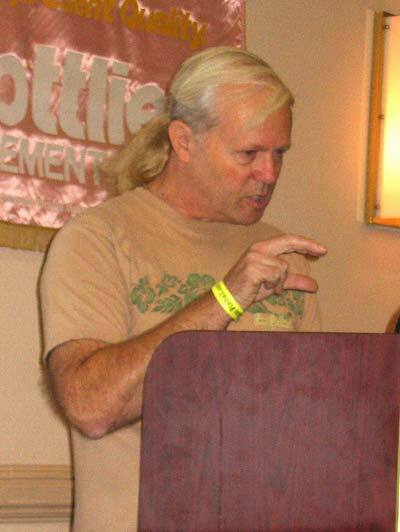 John Buras created the two-level game Black Hole but John Osborne went one better again with the three-level haunted house. He went on to talk about the problems associated with moving the ball from the lower level to the upper level and how he used a Perspex tube similar to the one used in Xenon but how that ended up being the game's Achilles heel as the kicker would eventually weaken and not be able to move the ball that distance. John Buras then spoke about how he started at Gottlieb in 1973, working there part-time while still at college, testing electromechanical games and sub-assemblies. Wayne Nyens gave him the chance to join the engineering department where he trained with Ed Krynski who he described as his mentor. His degree in electronics was well suited to the company's transition from EM to solid state games but Gottlieb turned to Rockwell for their first SS electronics. System 1 was first used on Cleopatra and Sinbad as games were made in both EM and SS versions. 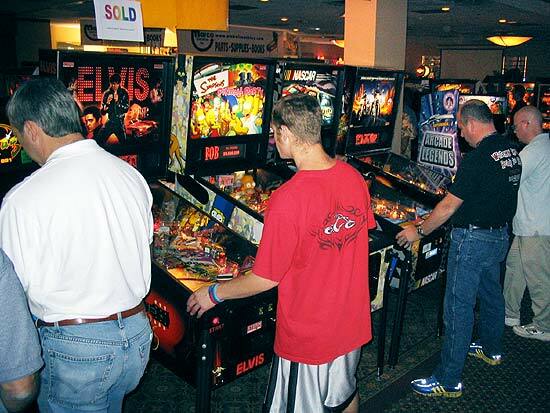 John said he thought it a mistake to go to an outside company for the electronics system as Rockwell didn't understand the pinball industry and the way the system would need to expand as games developed and became more complex, and that's why System 1 was only used for 16 games over 3 years. He subsequently worked in-house with John Trudeau on developing the System 3 boardset with the intention of eliminating the need for external driver boards (such as for pop bumpers) by using the main controller board instead. By contrast with System 1, System 3 was used in 33 games over a 7 year life span. The first game he designed was Buck Rogers. 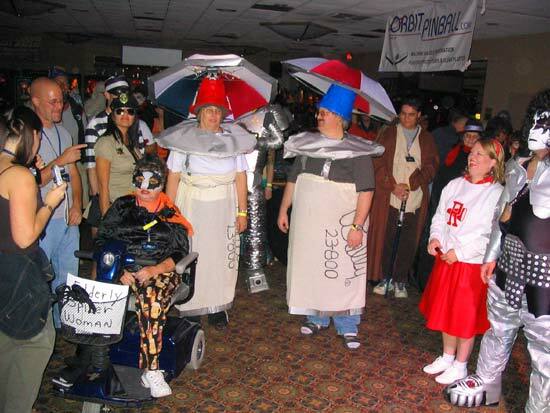 It was created as a golf theme called Par 4 but themes were chosen by management and space/sci-fi was all the rage at the time so it became Buck Rogers. Changing themes was common in those days until licensing came along and the games had to be designed with the themes in mind from the start. He talked about how, when faced with creating a lower playfield for Black Hole he tried various designs and windows and decided a playfield that sloped away from the player was the best solution. The team tried a number of different window materials and colours but when they saw the blue perspex it was obvious that was the way to go. but strongly disliked the previous implementations where the ball could drain through the gap between the two flippers on one side, so used a wire ball guide to prevent this. 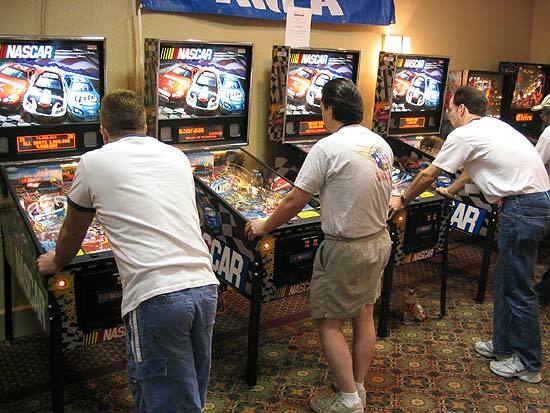 Both men were keen to stress the family atmosphere at Gottlieb which was in contrast to some of the other pinball companies and gave them a feeling of support from their colleagues mixed with friendly rivalry. They said everyone there seemed to have been at the company forever. Indeed, both John Buras' parents worked at Gottlieb and they met there. That atmosphere gradually slipped away as sales declined and the company was bought out by Columbia Pictures and both men left the company in 1984 after it was became Mylstar. John Osborne moved back to California to work at a company making rack mount AC power controllers. John Buras later rejoined Gottlieb when it became Premier and went on to design Bounty Hunter and Strikes and Spares. 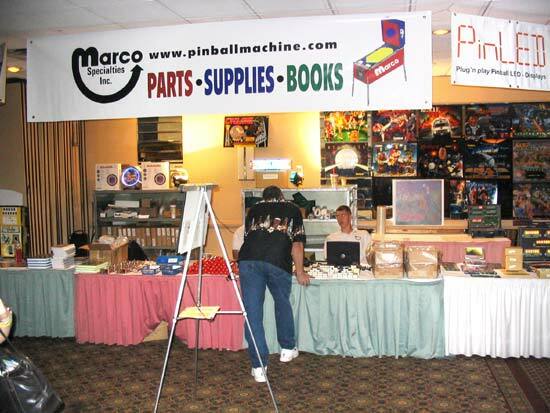 He left when the company closed down pinball production and has been working at a high speed inkjet printing company for eight years. While at Premier he also developed a bladeless switch based on piezoelectric material - a substance that creates an electrical current when flexed. It eliminated the problem of dirty contacts and was eventually produced as direct plug-in replacements for existing Gottlieb rollover, rollunder and standup targets. The technology was actually used in the game Shaq Attaq for the basket sensor and continues to be a possible alternative for producing more reliable switches today. 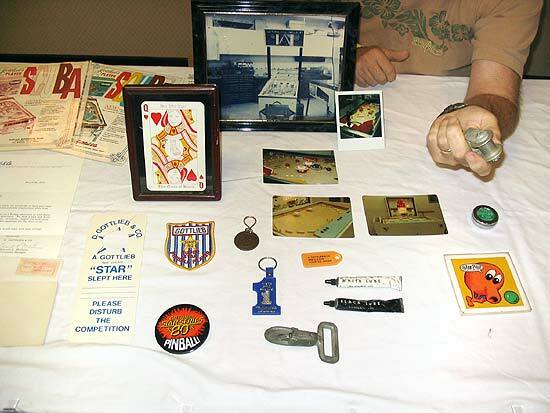 They also brought along a selection of Gottlieb memorabilia including product catalogues, promotional material and John Osborne's original letter offering him employment at Gottlieb. Once the seminar had finished both men were happy to chat about their work both in the seminar hall and later in the evening outside the main exhibition hall. Meanwhile, inside the hall the main the fancy dress competitions were taking place. 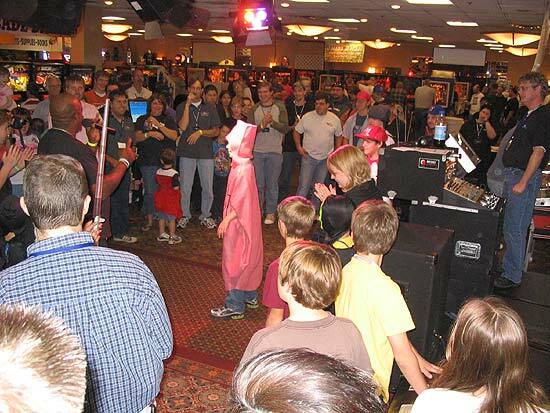 A tradition of the Texas Pinball Festival, around twenty people joined in with a combination of the scary, the humorous and the plain weird. ...followed by the grown ups! NASCAR games set up at one end of the hall. Qualifying involved getting one of the top 16 scores by the close of play on Saturday night. Those 16 played on Sunday in a double-elimination competition best-of-three games against a single opponent. Losers from that round entered the elimination round where they played another first round loser for the chance to stay in. Essentially, if you lost two best-of-three matches at any point in the tournament, you were out. Hence the "double-elimination" name. While the double-elimination format worked fine, it is slightly confusing when it gets down to the last few players and the best-of-three play throughout led to the competition overrunning on Sunday afternoon. 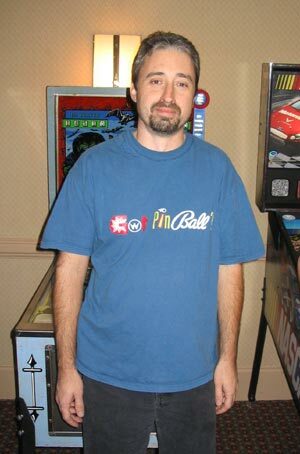 Despite losing one game, the highest scoring qualifier Jim Belsito went on to claim the Pinball Wizard title. His score of 22,136,090 beat fellow finalist Robert Byers' 5,340,070 with Trent Augenstein in third place and Derek Fugate in fourth. 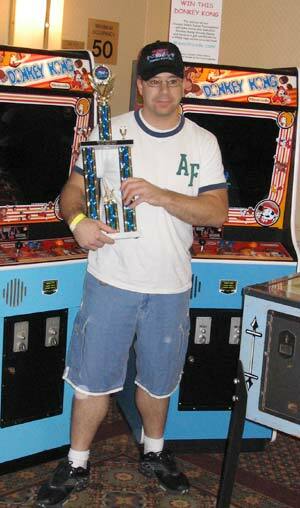 Fortunately, the Classic Video Game tournament ended on time with Andy Rosa winning a brand new Donkey Kong game with a score of 126,400. Second was Dwayne Richards with 115,500 and third Chris Brooks on 106,800. 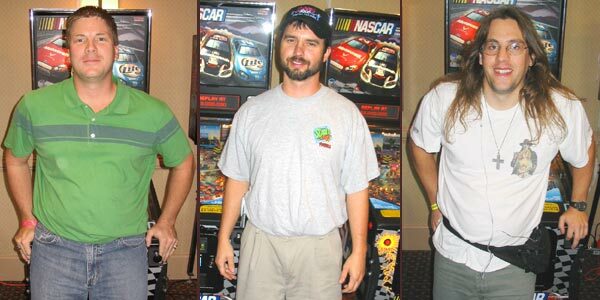 In other tournaments, Dustin Johnston & Trent Augenstein won the "Draw Your Partner" competition, Chris Newsom & Brian Dominy won the "Flippers" tournament on Xenon and Scared Stiff, Scott Riegel won the kids' tournament, Eric & Jeff Fisher won the "Parent/Child" tournament, Andy Rosa also won the "Monster Bash" competition and Kevin Dreyling triumphed in the "Electro-mechanical Pinball" tournament. 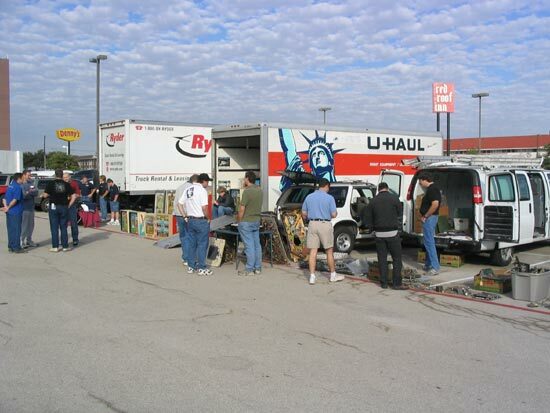 By Sunday many of the vendors had packed up and left but in contrast to some other shows, nearly all the games remained set up to play and the smaller number of visitors gave a good chance to catch up on the games that couldn't be played in the busier times. 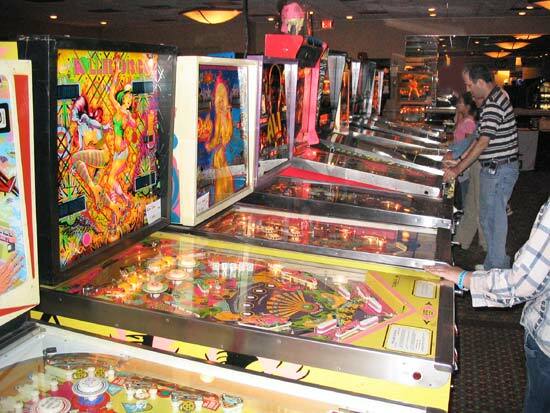 With a total of two full days of pinball action, competitions and fun for just $25 if you pre-register, the Texas Pinball Festival has to be great value for money. The hotel is very good value too and there are a few places nearby to get food and snacks if the restaurant or bar didn't take your fancy. I don't know how much business the vendors did but I saw quite a few games change hands over the course of the show and the number of games remaining all the way through until Sunday was very impressive and appreciated by us players. The two Johns did a great job both in the seminar and afterwards and clearly had some great stories to tell about their times at Gottlieb. So all-in-all, it was another great show from the Texas team - congratulations to all involved - and in this, its fifth year, the show is still going strong. a video tour of the Texas Pinball Festival in just two minutes. See the games, the vendors, the people and sample the atmosphere.